If you are looking for a gift for a Disney villains fan look no further than this Disney Villains Print Duffle Bag. features The Evil Queen from Snow White and the Seven Dwarves, Cruella De Vil from One Hundred and One Dalmatians, Maleficent from Sleeping Beauty, Ursula from the Little Mermaid and the Queen of Hearts from Alice in Wonderland. I have owned this bag for a while now and I can confidently say it is the Disney bag which gets the most compliments! It is a good size at 10 inches wide, 9 inches high, and a 7-inch depth. It has a 5-inch handle drop but also has a long crossbody strap if you want to carry it on your shoulder. Another great feature is that it zips across the top so you feel confident carrying it around. We always really like the Disney Dooney and Burke bags of course, but they are on the pricey side. This Loungefly bag is of comparable quality for a lot less money. Of course, one reason for this is that the Loungefly bags are faux leather. We actually prefer this too. Much more animal-friendly. 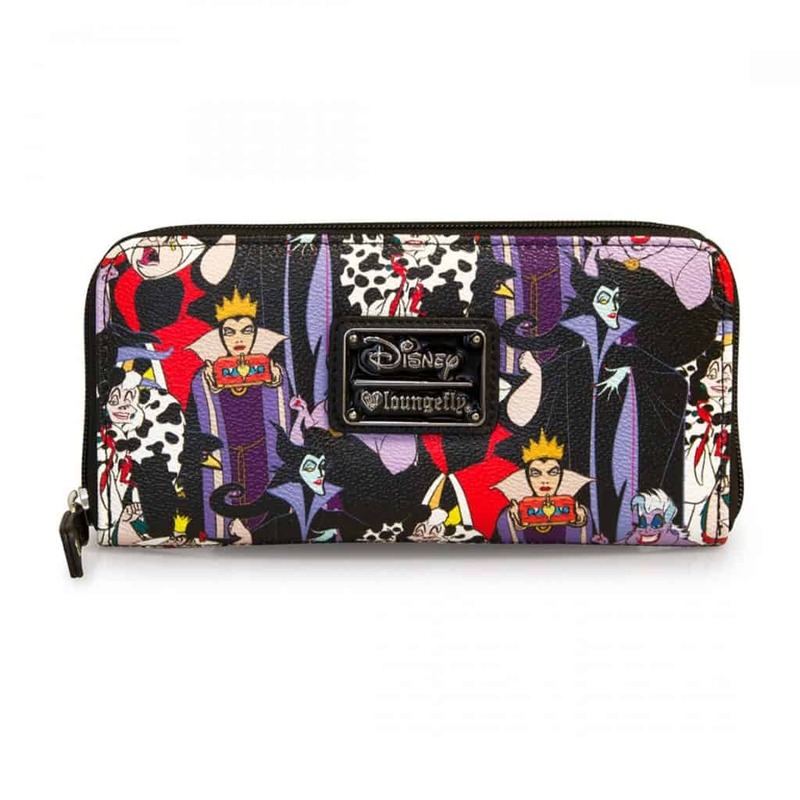 There is also a matching Loungefly Disney Female Villains wallet which features the Evil Queen, Maleficent Cruella and Ursula. 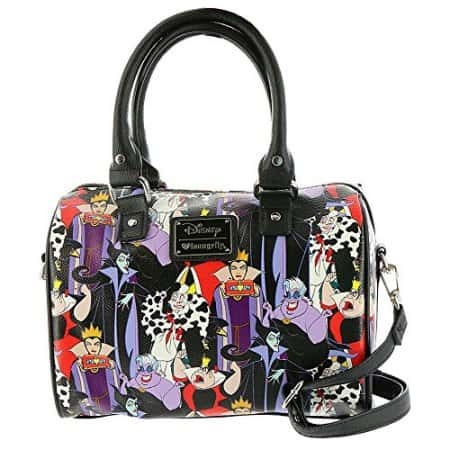 There are two different prints available for the Loungefly Disney Villains Wallet. Both a great but we prefer the one which matches our bag! This, like the bag, is vegan-friendly faux leather. It has a zippered closure and measures 8 in x 4 in x 1 inches. There is plenty of room for cash and coins inside. 8 card slots, 2 cash slots, and a zippered coin holder. It is a good size – just big enough to hold everything you need. Both of the Loungefly Disney Villains wallets are identical in size. The only variable is the print design. Just pick which one you like best! The faux leather material is very durable and the colors of the design will ensure you get plenty of envious looks! At 9 x 10 x 4.5 inches, this is the perfect size for carrying things around the Disney parks. It has two side pockets which are large enough to carry your phone. Everyone will want to know where you got this! I actually like the backpack style for visits to the Disney parks. It is really convenient to have a mini backpack in the park. You don’t want to carry a large bag with you, and it holds all the things that you need. 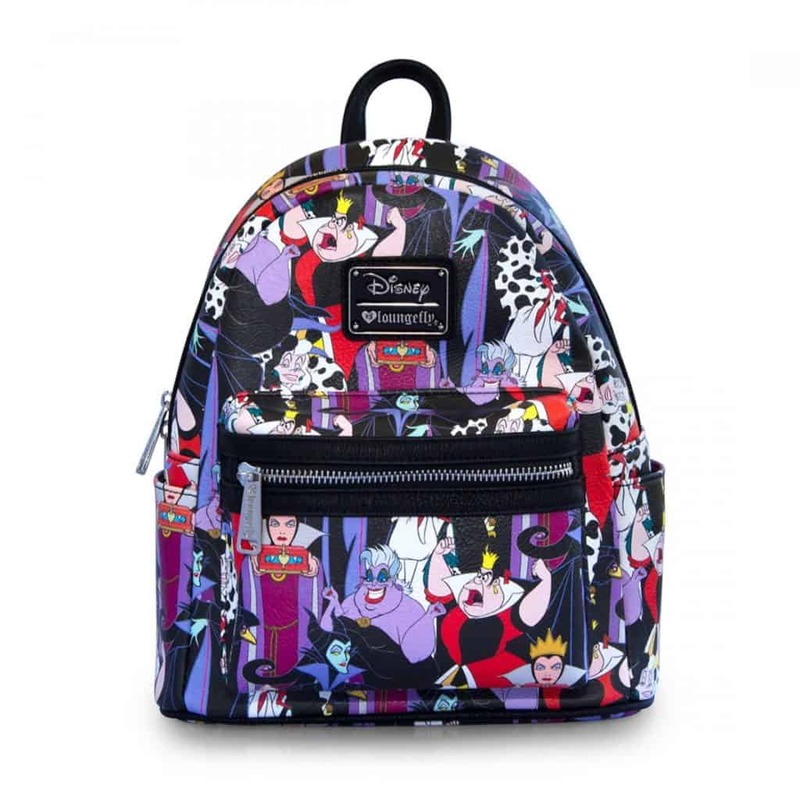 Which Disney Villains bag do you like best?